This Comfort in a Bag package has exactly what you need to enhance the comfort of your sleep surface and it adds that extra feel that will leave you sleeping healthier! ²Pillow size 28" X 16"
³Pillow size 24" X 16"
Pillow Cover: Tencel cover treated with silver clear is soft and supple and has incredible wicking abilities to keep skin dry. Cotton Quilted Mattress Pad- Our cotton mattress pad is quilted with a 100% cotton outer quilt and it is filled with a soft Poly fiber. Very soft and breathable. It stays on very well with its fitted elastic corners and it can be tucked in all sides. 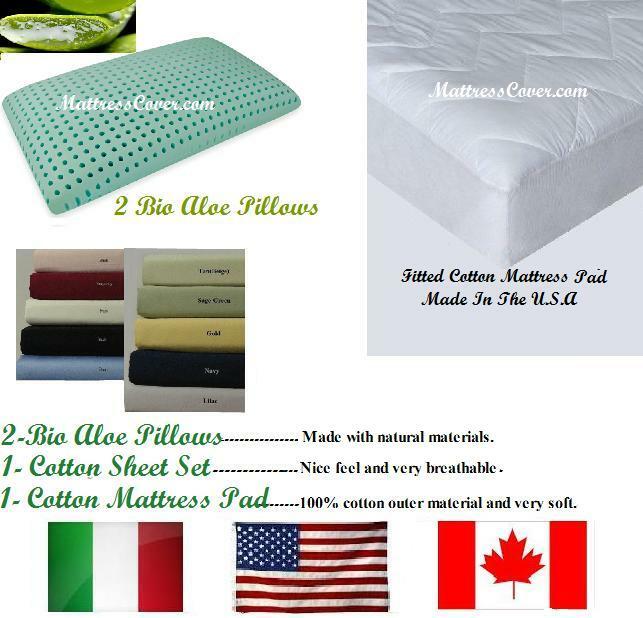 It is also made in the U.S.
100% Cotton Sheet Set- These sheets are 100% American made. Their softness and breath-ability gives it a hotel style feel. Sheets are 100% Cotton with 300TC. Our sheets are not sewn together at the foot and they do have fitted pockets. Many solid color are available. ¹ Two pillows are included for orders in the following sizes: king, king waterbed, queen, queen waterbed, and full. ¹ One pillow for orders of size super single and twin. 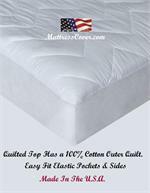 ² Orders in king waterbed and king size receive pillows in the size of 28" x 16". ³ Orders for queen waterbed, queen, full, twin & super single receive pillow(s) in the size of 24" x 16". Naturally made bed pillow chemical free? Aqua gel pillow is one of our best selections - Italian water based foam gel. This pillow is perfect for all types of sleepers; side, stomach, back. Comfortable w/ cool feel, calming & anti-inflammatory effect. Latex Bed Pillow Traditional Latex (Foam produced in Italy (Europe), Fabric made in Canada & USA) Our 100% latex pillows are an ideal solution for a natural, healthy sleep. These pillows are comfortable, healthy, anti-mite, mold & non toxin.